Georginio Wijnaldum has morphed from a 15-goals-a-season player into a brilliant all-rounder. He’s not Liverpool‘s most glamorous player, but he’s bloody good. If Liverpool lift the Premier League trophy at the end of the 2018-19 season, several players will write their names into the history books. Casual fans will hail the impact of Mohamed Salah, the focal point of Liverpool’s attack whose arrival transformed the team into title contenders. Close behind will be Roberto Firmino and Sadio Mané, Salah’s ludicrously talented assistants. More pragmatic supporters will lavish praise on Liverpool’s new-look defence. Virgil van Dijk has proven himself the best centre-back in the world over the past 12 months, while the addition of Alisson Becker has — to the endless disappointment of neutrals — removed the team’s biggest and most adorable handicap. Who knows, Liverpool may yet loosen their grip on the title, but with Lorius Karius they wouldn’t have had the chance. But looking for fan favourites among this Liverpool side is simply too easy. Because besides the attacking trio and the rugged back line, there is still room for a handful of cult favourites. The Kop has made Andy Robertson its most beloved left-back since John Arne Riise, while Trent Alexander-Arnold on the other side provides an important local connection. Even the all-English engine room of Jordan Henderson and James Milner, wheeled out for coal shovelling and slide tackling in the biggest games, is able to warm the hearts of patriots, contrarians and football hipsters. In fact, so well-oiled is this Liverpool machine, so charismatic this group of players, one can identify fan favourites throughout the entire team. Everywhere, it seems, except one position. Midway through last season, Liverpool revealed that Georginio Wijnaldum, for whom they paid £25million roughly a year and a half earlier, was not among the top 10 names printed on its replica shirts. Fans considered the Dutchman’s name less desirable than Emre Çan or Simon ‘safe hands’ Mignolet. Even the very-obviously-outbound Coutinho remained popular. In fairness, it’s easy to see why Wijnaldum receives little fanfare. Deployed as part of an industrious midfield three, his role is to win the ball and keep it. He provides few goals and few assists and is a less conspicuous grafter than the Henderson-Milner axis of fuel consumption. Even his squad number asks you to look elsewhere. 5, for a central midfielder, has only ever been pulled off by Zinedine Zidane, and it was eye-watering even then. In this sense, Wijnaldum’s role is seemingly to avoid notice at all times — even though he has the talent to play a more visible attacking role. It’s worth remembering that, when Jurgen Klopp bought the Dutchman in 2016, he had scored four goals in a single Premier League match less than a year earlier. Perhaps it’s written in Mo Salah’s contract that only he can do such things. So Wijnaldum, who has actually scored more than 100 career goals (almost as many as Firmino and Mané), now simply keeps things ticking over. And, to his credit, he does that very well. For Klopp, however, Wijnaldum’s footballing camouflage is not of the player’s own making, but of ours, you and I, lazy observers whose untrained eye cannot look beyond goals, assists and inappropriate squad numbers. But while Klopp may have a point — perhaps we should try harder to ignore Mo Salah’s incredible and frequent goals to focus on Wijnaldum, who, you know, keeps things ticking over — one can’t help feeling a little concerned for the Dutchman, who, should be pick up a winners medal in May, might well become a Pointless answer in 20 years. Recognition from the truly discerning fan is great, but will Gini ever get the widespread respect he deserves? In the short term, the answer is ‘definitely not’. Perhaps, however, that’s no bad thing for Wijnaldum. Time has a way of lifting under-appreciated talents to their deserved level, and it’s very possible that the midfielder’s legacy will be built in retrospect, with football archivists spotting his best-in-the-team 92% pass completion and realising, in the most low-stakes of eureka moments, that he really was a vital cog in this Liverpool team. After all, tributes to barely visible former players like Steve Finnan have been slow to gestate but, look, here they come. Elsewhere, hindsight has boosted the reputations of subtle talents like Gilberto Silva and Michael Carrick — and they didn’t have Wijnaldum’s lovely smile. 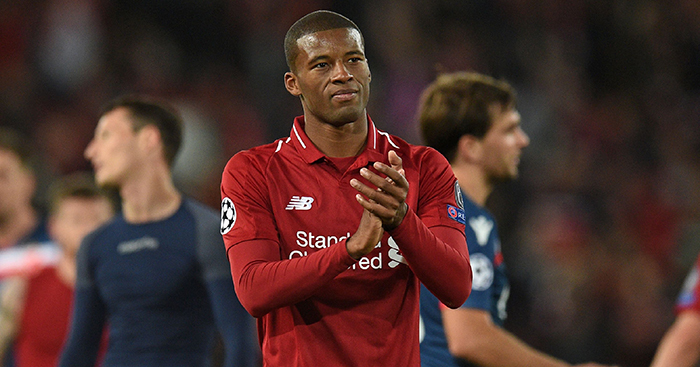 What’s most impressive about Wijnaldum’s quiet dominance is how, despite comments to the contrary, Klopp himself might have underestimated the Dutchman’s talents. While the midfielder’s minutes on the pitch this season prove how valuable he is to this team, the big-money signings of Naby Keita and Fabinho over the summer suggested that it could have been a season of rotation for Liverpool’s No.5. His quietly brilliant performances have prevented that from happening. Wijnaldum, ultimately, might not get the praise he deserves at the end of the season. He may not even get it while he plays for Liverpool or before he retires altogether. Maybe, however, when a gaggle of young Scousers discover a tattered ‘Mignolet 1’ shirt in the dusty aisle of a Tuebrook Barnardo’s in the year 2039, they will laugh scoldingly at their mums and dads for picking any player besides ‘Wijnaldum 5’ — a player who scored 14 goals in three separate Eredivisie seasons, who then morphed into a water-carrying enigma to deliver Liverpool’s first title in 29 years. Who could be more worthy?